Radius Ensemble started its season on Saturday at Pickman Hall at Longy-Bard with a short program that in large degree reflected composers reacting to genres created by earlier greats. That sense of dialogue with past masters can also be extended to the one work on the program that wasn’t in the mold just described. That latter piece was the opening one, Ravel’s brief but evocative Pièce en forme de habanera, which was here performed by Jennifer Montbach, oboe and Ina Zdorovetchi, harp, in a transcription by the great 20th-century composer and harpist Carlos Salzedo (Montbach said later that Salzedo made the arrangement for harp and “any instrument in C”). Originally called Vocalise-étude en forme de habanera, Ravel wrote it in 1907 on commission from Paris Conservatoire professor A-L Hettich to be used in his voice classes. The original scoring was for low voice and piano, but you would be hard-pressed to find a performance of it in that form. For a lovely turn by soprano Gloria Londoño, go here (bonus: the page-turner is also a prominent musician). It has been arranged for seemingly every solo instrument under the sun. Salzedo’s scoring for harp perfectly renders Ravel’s delicate harmonies, which Zdorovetchi elicited with nuance and grace and Montbach, after a somewhat assertive opening, glided smoothly above the insistent habanera rhythm. While the obvious reference in the title of the first-half-closer is to the prehistoric fish thought extinct but rediscovered in 1938, one imagines that its composer’s real allusion is to his own status as an unfashionable “living fossil” tonal composer—albeit a sometimes spiky one—amid mid-20th-century academia’s hostility to tonalists. William Bergsma’s (1921-94) The Voice of the Coelacanth, a 1981 work by for violin, horn and piano, supplements the genre famously established by Brahms. It’s doubtful that when a composer creates a unique instrumental ensemble (s)he expects it to become the starting point for a long line of successors, but there has to be a first for everything, and when the first is by somebody first-rate, then the chances are much improved for take-up. Brahms knew that perfectly well, his piano quintet being a clear successor to a genre effectively created by his mentor Schumann. Meanwhile, any composer who picks up the torch from a famous predecessor has to look at how to approach the genre without slavishly imitating. 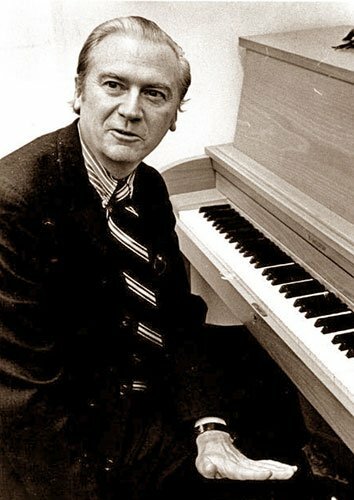 In Bergsma’s set of “rhapsodic” variations on an original theme, he eschews Brahms’s smoothly blended sonorities to prioritize the unique properties of each instrument. The theme begins with a motto motif that appears often in its original form. It starts in the horn (Anne Howarth), then is taken up contrapuntally in the violin (Gabriela Diaz), before the piano (Sarah Bob) barges in with a cascade of gritty percussive ructions, an expressive personality with which Bergsma imbues the instrument in much of the piece. As noted, the instruments are often heard in isolation or as a solo line; where they are together they are more often than not in unison or octaves. The coelacanth in question is an eloquent one, with the variations highlighting a range of performance techniques (the variation with horn and violin muted is stunningly beautiful). The performances were first-rate, with Diaz’s line floating, Howarth’s robustly intoning, and Bob’s forcefully declaiming without pounding. Another very good recent performance can be heard here on an all-Bergsma CD. Another take on a genre created by a musical giant, Fang Man’s Larkspur for the Debussy ensemble of flute (Sarah Brady), viola (Noriko Futagami) and harp (Zdorovetchi), began the second half. The youngish Chinese-born Fang (who goes by Mandy when in the US) is becoming better known, particularly since a stint in Paris at IRCAM picking up the argot of electronics. Larkspur is an earlier piece (2004) written while getting her graduate degree at Cornell under Roberto Sierra and Steven Stucky. In introducing it, Brady seemed to be apologizing for its having been a “student” piece, but in fact Fang was the same age writing this that Beethoven was writing the unapologetically performed trio that ended the program. While admittedly devoid of bleeps and bloops, and occasionally (and quite understandably) in love with the sound of the Debussy trio, it stands up very well on its own; it is a quite lovely little essay in a refreshingly intelligible ABA form (though the motifs are in scrambled order in the return), with a charming integration of Chinese and Western sounds, all motivated, Fang says on her website, by the appearance of this flower outside her window in the chill air high above Cayuga’s waters (well, she didn’t say that in so many words). Brady seemed as secure as could be in the microtonal bends and fluttertonguing the score required; Zdorovetchi achieved elegance in the highly idiomatic but still original part for harp. The one weakness in the writing came in the viola part’s scoring mostly for its upper ranges—perhaps an act of independence from the Debussy model, but not producing the most grateful sounds the viola can make. Futagami nevertheless carried it off with a fine lyricism. This too is available to listen to online, on Fang’s own website, here. It is possible to argue that Beethoven’s op. 11 Trio in B-flat for clarinet, cello and piano, from 1797, was either the first of its genre or, like the preceding two works on the program, a reaction to a genre created by a great master. It is, as far as available databases know, the first example of this instrumentation (Beethoven later transcribed the clarinet part for violin, giving fits to anyone trying to number his piano trios); at the same time, it is the second known work for “clarinet trio,” because Mozart’s Kegelstatt Trio of 1786 was the first to combine clarinet with string and piano. The literature on the Beethoven work does not support the kind of direct link to Mozart that exists, for example, with the op. 16 quintet for piano and winds, so our vote is for genre creation. In the event, it was created at the behest of clarinetist Joseph Beer for a set of variations on the enormously popular aria “Pria ch’io I’impegno” from Joseph Weigl’s opera L’amor marinaro ossia il corsaro, an aria that, like Verdi’s “La donna è mobile,” became a pop hit on its own. The nickname “Gassenhauer Trio” given to the Beethoven work means just that: pop hit trio (Gasse is the word for alley, used musically just like Tin Pan Alley). It is one of his most genial pieces (it is reported that Beethoven groused later about how he had pandered to public taste in the third movement, which was the requested set of variations), and it gets a lot of play, since performers love it too. Vigor coupled with minute attention to phrasing and dynamic contours characterized the reading by Radius’s Eran Egozy, clarinet; Miriam Bolkosky, cello; and Bob, with Egozy’s sound generally bright, Bolkosky’s elegant and Bob’s brilliant. The slow movement featured soulful solos by Bolkosky and Egozy, and the finale, despite some questionable portamento from Bolkosky, came off with great verve. In August, British pianist Stephen Hough argued that concerts should eliminate intermissions and provide listeners with a solid 60-80 minutes of music. This sounds reasonable—in fact the standard two-hour concert, allowing for intermission and stage business between pieces, seldom has more than 75 minutes of actual music in it. We bring this up here because by our reckoning Radius provided barely 45. Is this all that modern attention spans can handle? One doesn’t, for instance, get a whole lot of musical argument in three minutes (Ravel). Should there have been more? We’re not asking for Mahler or, God forbid, Bruckner on every program, but are there upper and lower limits of toleration in your basic evening concert (setting aside opera, which has its own issues)?